Up to 24 passenger. Great for night out. There are few occasions where twenty plus people need to pile into the same vehicle at the same time. Most of the time, this scenario is seen only with public transportation, but there is that rare occasion when a large group of friends or a family gathering calls for one giant form of transportation. When an occasion like a family reunion or a bachelorette party arises, there is really only one way to satisfy the needs of your traveling gaggle. With the ability to transport over twenty people at one time, the Party Bus is the only means of allowing your large crew to travel together. When deciding whether or not to go with a party bus or a large limousine, it comes down to one thing – size requirements. While most limo's range anywhere from six to ten passengers, the average party bus starts at a minimum of fifteen passengers. 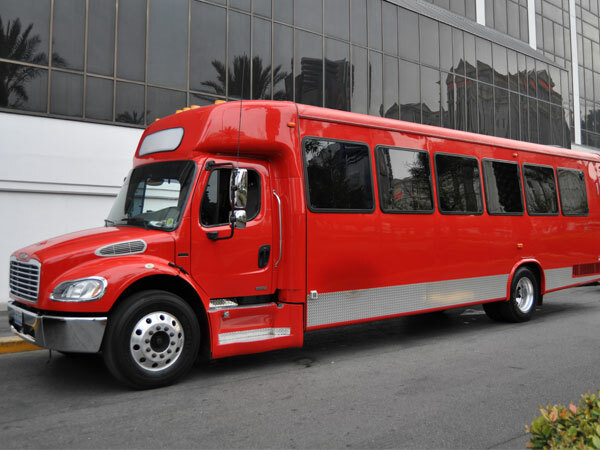 Party buses are not only perfect as extensions of special occasions and large parties, but also make for the ideal opportunity for people to chip in together and negate the need for individual travel to events like weddings and family reunions. When a wedding requires a fair amount of travel, renting a Party Bus with many other of the event's guests may end up costing less than the gas to and from the venue. 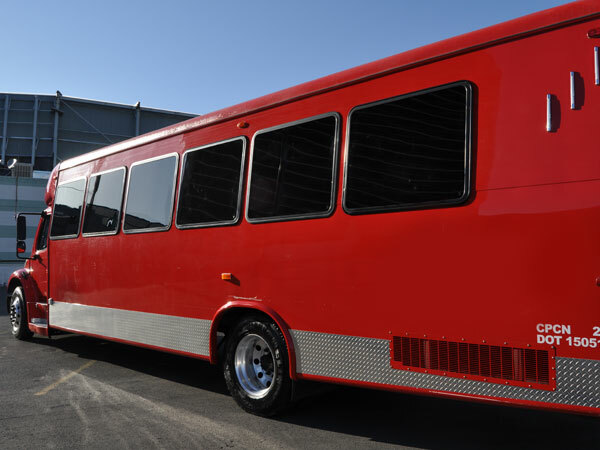 Available in varying sizes, the Party Bus can fit anywhere from fifteen to forty-five guests. 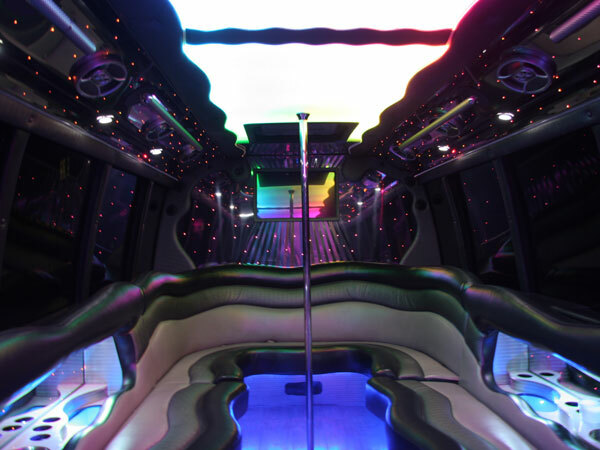 Though you may picture the average Party Bus as being no fancier than a regular public bus, varying styles exist and can include such items as the always required stripper pole, flat-screen television with DVD player, CD player, and surround sound stereo setup. The larger the bus, the more likely you are to have access to multiple televisions and luggage room in the back while smaller buses allow for removable seats for extra storage and fewer amenities. Just because the bus is smaller, though, doesn't mean style gets thrown out the window. Despite its size, most Party Buses come equipped with limousine style seating made up of comfortably plush leather chairs. For that perfect Bachelor or Bachelorette party experience, the forty-five person party bus is the ultimate in mobile partying and offers a once-in-a-lifetime affair. Typically equipped with neon lighting, hard wood flooring, on-board bathroom, and a full bar with your own personal bartender, these Party Buses are a requirement when planning that overly large event. Since pre-wedding parties can get a little out of hand in terms of the continuous river of alcohol, it's best to have a vehicle large enough to accommodate all guests, even those that may drive themselves to the venue. Whether you're planning that extreme party for a soon-to-be bride or groom, transporting a large group of family members to a family reunion, or chipping in with friends for a ride to the prom, the Party Bus may not look like much from the outside, but the experience on the inside more than makes up for its less than extravagant look.